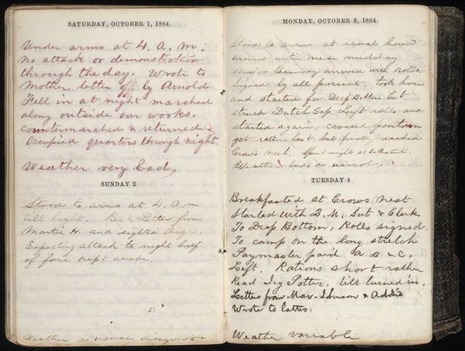 Description: During the night of September 28-29, Maj.
Gen. Benjamin Butler’s Army of the James crossed James River to assault the Richmond defenses north of the river. The columns attacked at dawn. After initial Union successes at New Market Heights and Fort Harrison, the Confederates rallied and contained the breakthrough. Lee reinforced his lines north of the James and, on September 30, he counterattacked unsuccessfully. The Federals entrenched, and the Confederates erected a new line of works cutting off the captured forts. Union general Burnham was killed. As Grant anticipated, Lee shifted troops to meet the threat against Richmond, weakening his lines at Petersburg. The Battle of Chaffin's Farm and New Market Heights, also known as Laurel Hill and combats at Forts Harrison, Johnson, and Gilmer, was fought September 29–30, 1864, as part of the Siege of Petersburg in the American Civil War. From the very beginning of the war, Confederate engineers and slave laborers constructed permanent defenses around Richmond. By 1864, they had created a system anchored south of the capital on the James River at Chaffin's Farm, a large open area at Chaffin's Bluff, both named for a local landowner. This outer line was supported by an intermediate and inner system of fortifications much closer to the capital. In July and August 1864, these lines were tested by Union Lt. Gen. Ulysses S. Grant in offensives designed to attack simultaneously north and south of the James. On July 27–29, the Army of the Potomac's II Corps under Maj. Gen. Winfield S. Hancock and cavalry under Maj. Gen. Philip Sheridan attacked New Market Heights and Fussell's Mill in the First Battle of Deep Bottom (named for the section of the James River used for the Union crossing). The attacks did not break through to directly threaten Richmond or its railroads, but they did cause Confederate Gen. Robert E. Lee to transfer men from the Petersburg fortifications in preparation for the Battle of the Crater on July 31. The Second Battle of Deep Bottom was conducted by Hancock on August 14–20, attacking in roughly the same areas with the goal of once again drawing Confederate troops away from south of the James, where the Battle of Globe Tavern (also known as the Second Battle of the Weldon Railroad) was attempting to cut the railroad supply lines to Petersburg. The second battle was also a Confederate victory, although Lee was forced to deplete his Petersburg defenses and abandon plans to reinforce his men in the Shenandoah Valley. In late September, Grant planned another dual offensive. (Historians sometimes enumerate Grant's offensives during the Richmond–Petersburg Campaign. Richard J. Sommers, John Horn, and Noah Andre Trudeau call these operations "Grant's Fifth Offensive". Grant's primary objective was to cut the railroad supply lines to the south of Petersburg, which would likely cause the fall of both Petersburg and Richmond. He planned to use a cavalry division under Brig. Gen. David McM. Gregg and four infantry divisions from the V and IX Corps of the Army of the Potomac to sever the South Side Railroad, an operation that would result in the Battle of Peebles' Farm from September 30 to October 2. 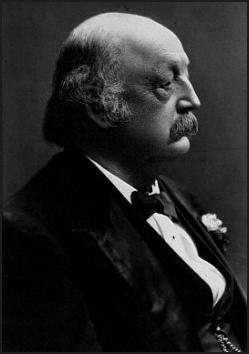 Once again hoping to distract Robert E. Lee and draw Confederate troops north of the river, Grant ordered the Army of the James under Maj. Gen. Benjamin F. Butler to attack toward Richmond. Butler devised a plan that historian John Horn called his "best performance of the war." 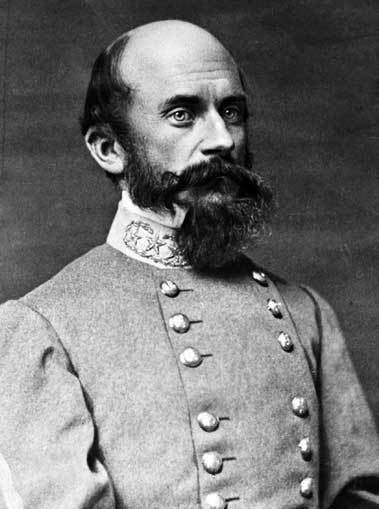 Rather than repeat the efforts of July and August to turn the Confederate left, Butler planned surprise attacks on the Confederate right and center. His XVIII Corps under Maj. Gen. Edward O. C. Ord, would cross the James River to Aiken's Landing by a newly constructed pontoon bridge. At the original Deep Bottom pontoon bridge, his X Corps under Maj. Gen. David B. Birney would cross, followed by his cavalry under Brig. Gen. August V. Kautz. In a two-pronged attack, the right wing (Birney's X Corps, augmented by a United States Colored Troops division under Brig. Gen. Charles J. Paine from the XVIII Corps) would assault the Confederate lines at New Market Road and drive on to capture the artillery positions behind it on New Market Heights. This action would protect the flank of the left wing (the remainder of Ord's XVIII Corps), which would attack Fort Harrison from the southeast, neutralizing the strongest point of the entire Confederate line. Then, the right wing would assist the left by attacking Fort Gregg and Fort Gilmer, both north of Fort Harrison. Kautz's cavalry would exploit Birney's capture of the New Market Road by driving for Richmond. 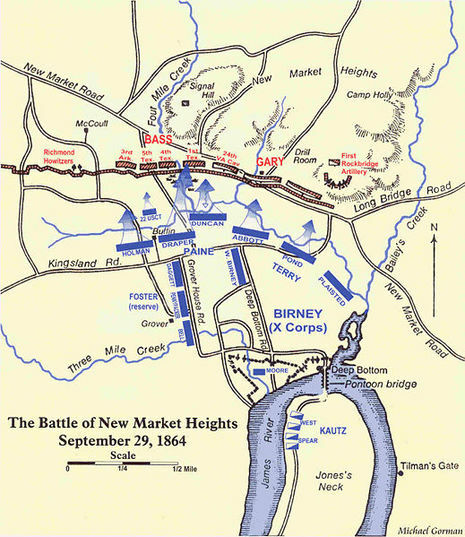 Maj. Gen. David B. Birney moved the X Corps north from the Deep Bottom bridgehead toward the Confederate works atop New Market Heights manned by Brig. Gen. John Gregg. A brigade of U.S. Colored Troops attacked the heights but was repulsed. In this attack, Christian Fleetwood's actions would later earn him the Medal of Honor. Birney reinforced the assault force and stormed the heights again. Alfred H. Terry's division managed to turn the Confederate left flank, thus turning the tide of the battle. Word of Union success against Fort Harrison then reached Gregg, compelling him to pull Confederate troops back to Forts Gregg, Gilmer and Johnson. Once Birney's troops had taken New Market Heights, the X Corps turned to the northwest along the New Market Road and moved against a secondary line of works guarding Richmond north of Fort Harrison. Brig. Gen. Robert S. Foster's X Corps division assaulted a small salient known as Fort Gilmer. David Birney's brother, Brig. Gen. William Birney, led a brigade of U.S. Colored Troops against Fort Gregg south of Fort Gilmer. These attacks were marked by heroism among the Colored Troops but were ultimately repulsed. At roughly the same time Birney's first attack moved forward, the Union XVIII Corps under Major General Edward Ord, assaulted Fort Harrison to the west of New Market Heights. Ord's assault was led by Brig. Gen. George Stannard, a veteran of Gettysburg. Stannard's men rushed across an open field and took cover in a slight depression just in front of the fort and, after a moment's rest, took the fort. The Confederate defenders broke to the rear, seeking refuge behind a secondary line. Brig. Gen. Hiram Burnham was killed during the attack; Union troops renamed the captured fort in his honor. Once inside the fort, the Union attackers became disorganized. Stannard was wounded and all three of his brigade commanders were also wounded or killed. A supporting column under Brig. Gen. Charles Heckman veered far off to the north and was repulsed. Ord personally attempted to rally the troops to exploit their success, but he too fell with a critical wound. The loss of commanders and the presence of Confederate ironclads on the James put an end to the XVIII Corps' drive on Chaffin's Bluff along the James River. 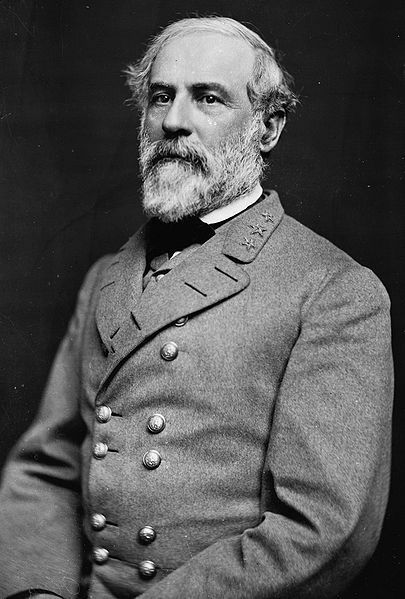 Robert E. Lee realized the severity of the loss of Fort Harrison and personally brought 10,000 reinforcements under Maj. Gen. Charles Field north from Petersburg. On September 30, Lee ordered a counterattack to retake Fort Harrison, now commanded by Maj. Gen. Godfrey Weitzel, replacing the wounded Ord. The Confederate attacks were uncoordinated and were easily handled. Just as Grant had anticipated, the fighting around Chaffin's Farm forced Lee to shift his resources and helped the Union army south of Petersburg win the Battle of Peebles' Farm. After October, the two armies settled into trench warfare that continued until the end of the war. The fighting around Chaffin's Farm cost the nation nearly 5,000 casualties.